Review | Many people dream of owning a pure-bred racing car, preferably from an Italian stable. Because of the high price, these dreams seldom comes true. Alfa Romeo wants to make dreams come true with the "4C". Is this a real sports car at the price of a luxury sedan? One thing is for sure: its looks leave nothing to be desired. On the open road the test driver receives countless thumbs up from other motorists. Others grab their mobile phone and take pictures of the 4C with one hand while driving their car with the other. At the start of the photo session so many people (including a bride and groom!) waned to have their pictures taken with the 4C that the Autozine photographer could do nothing but patiently wait until the car was free for the real thing. And there's good reason for all the attention. The Alfa Romeo 4C has the same, almost sensual, lines and perfectly balanced proportions as astronomically expensive sports cars. The only difference is that the 4C is a lot smaller. The latter isn't a problem. Instead, is is the "secret" of the 4C. That's because with sports cars it isn't about the engine, instead it is about the power to weight ratio. Because the 4C is smaller than usual, a smaller engine will do just as well and that results in a "smaller" price tag. On top of that, Alfa Romeo has tried to reduce weight in every possible way. In the main part, the 4C is constructed out of plastics and carbon fibre. Its lightweight character becomes most obvious in the cabin. Don't expect a cosy interior with beautiful upholstery or high grade-materials. The designers did not turn minimalism into an art, but instead opted for square lines and a bare-bone approach. While the outside of the car is a work of art, the inside is a big let-down. Still, both head and legroom are surprisingly good for a car like this. Luggage space is minimal, there's not even a glove box (imagine the weight!). Rightfully so, a radio is an option. The test car was fitted with the optional sports exhausts and they are so loud that a radio would be as useful as air conditioning on a motorbike; hardly noticeable at all. As it should be with a sports car, the engine is located behind the seats but in front on the rear axle, and it powers the rear wheels. By concentrating the bulk of the weight in the middle of the car, it becomes more agile. Here's a thought experiment: take a halter and position the weights on the far ends. Now imagine how much effort it would take to rotate that halter above your head. Now imagine how easy the same exercise would be if the weights where in the middle. The centre of gravity isn't just in the middle; handing is also improved by the lack of power steering. The steering isn't just direct, it also perfectly communicates what's going on between the tyres and the tarmac. This goes so far that the driver can actually feel the markings on the asphalt through the steering wheel! The wide tyres cause the 4C to react to any imperfection on the road. On long distances this is very tiresome, but on shorter distances it just enhances the experience. An electronic stability programme ("ESP") comes as standard, but it only works at the very last moment. The 4C certainly isn't a computer on wheels that instantly turns everyone into a racing driver. 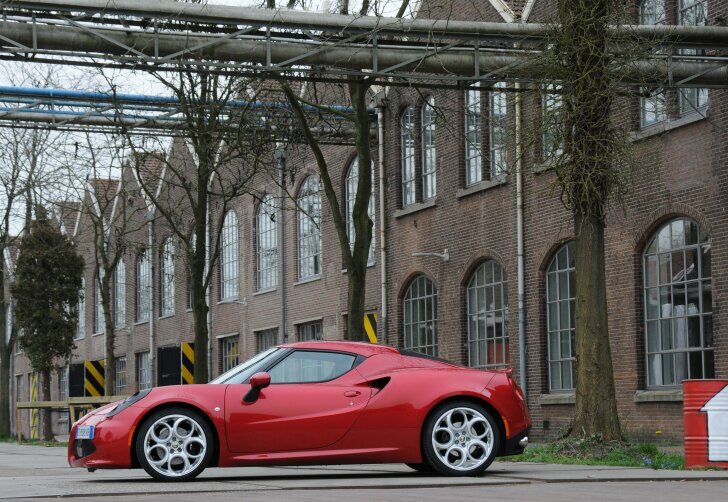 The 4C is all about mechanics, where grip is just as important as a perfect balance. This means it all comes down to the talent (and guts!) of the driver. Once one gets the hang of the 4C, this car can be faster than just about anything on the road. Like any other mid-engined car, visibility in the 4C is poor. The visibility in the rear mirror is minimal and the side mirrors are so small (and hardly adjustable) that the driver has little idea about what's going on around the car. Changing lanes in dense traffic is therefore more of a challenge than taking a hairpin at double the maximum speed. Speed bumps are not a challenge but simply a barrier: the 4C cannot cope with them without suffering body damage. Because the 4C is smaller and lighter than other pure-bred sports cars, a smaller and lighter engine suffices to deliver the same performance. 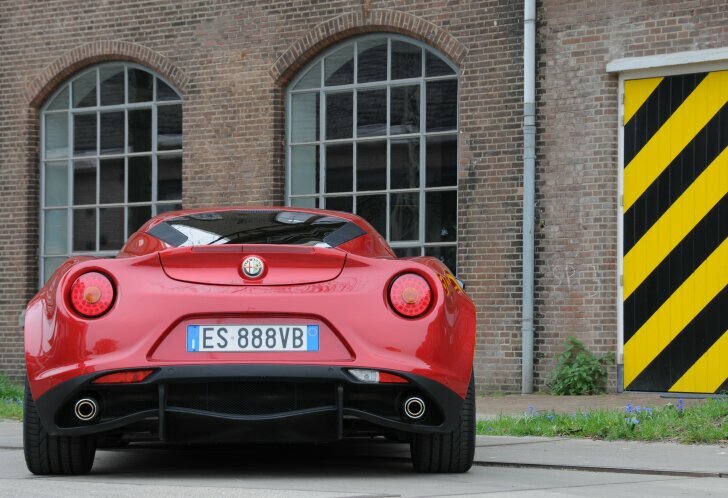 Instead of a costly six- or eight-cylinder engine, the 4C is fitted with the same 1.7 litre four-cylinder power train as the Alfa Romeo Guilietta. Thanks to a very eager turbo, all 240 horsepower are almost always at the driver's disposal. And thanks to the optional sports exhaust it sounds as if at least double the number of horses are ready to go. To make maximum use of the available power, a limited slip differential and "launch control" come as standard. The brakes are a good match for the powerful engine, but require some getting used to. The pure and undisturbed mechanical feeling that is so characteristic for this car lacks in the brakes. To keep the car in line while braking, the ABS assists much more frequently than usual. The 4C has a six-speed automatic gearbox with a double clutch. Thanks to this double clutch this automatic gearbox is faster and more efficient than a manual gearbox. Of course the driver can either shift sequentially or have the computer do the work. With a push of a button one can choose a comfortable or sporty character, but even in comfort mode the 4C is more aggressive and harder to handle than even the hottest GTI, Cosworth, Brabus or AMG. Pushing the throttle never results in an acceleration, but rather in launching the car. The engine revs so easily that the digital speedometer can't keep up and simply skips numbers. The acceleration from 0 to 62 mph in 4.5 seconds is brutal. The 4C doesn't set off, but bursts out. Even above 62 mpg the engine packs so much power that the occupants are pressed into their seats time and time again. 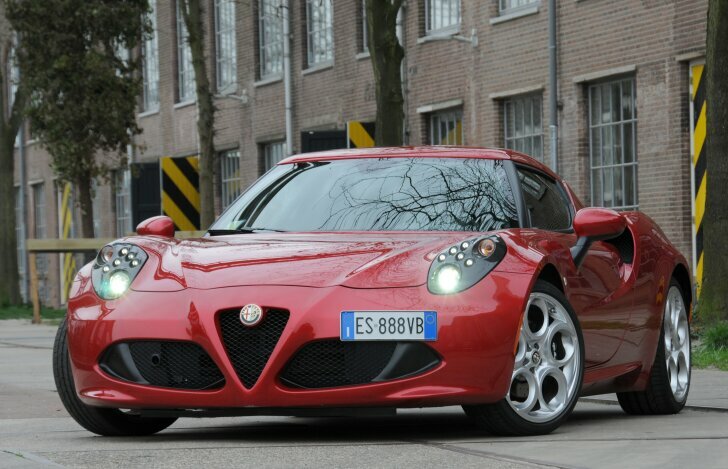 With a pure car like this there's no speed limiter to prematurely end the fun; the 4C will do 258 km/h. The whole experience becomes even more intense thanks to the deafening "sound track". The engine is mounted mere inches from the driver's head. The little barrier between the engine bay and the cabin does keep out the heat of the engine, but mechanical noises seem to penetrate it without any resistance. When the pedal is pushed to the metal, the turbo audibly gulps air, the exhausts gurgle, the engine screams and the gearbox whines. When put into cold hard numbers the 4C might be slightly slower than its rivals (which are at least four times as expensive), but the experience is at least as engaging. 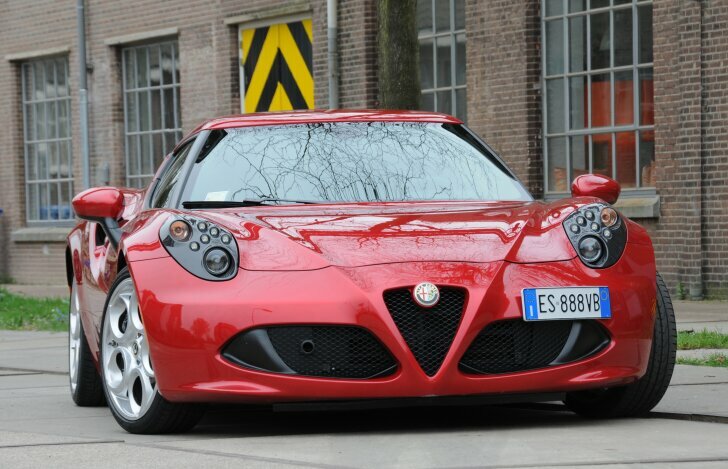 Is the Alfa Romeo 4C is pure-bred sports car at a quarter of the price of a regular sports car? Yes, without a doubt! The Alfa Romeo 4C makes no compromises thereby offering the same performance, sensation, impractical self-indulgence and of course beauty as cars that are far more expensive. 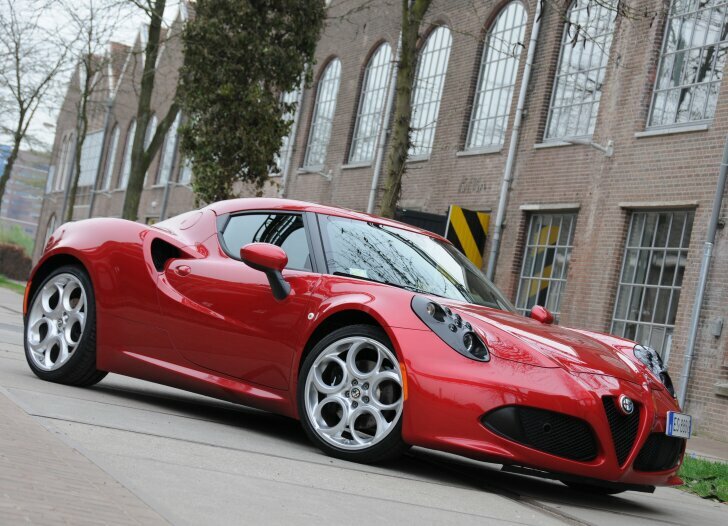 The secret of the 4C is in its compact dimensions. This makes the car lighter, which means an off-the-shelf engine suffices. Thanks to enhanced engine management and a smart automatic gearbox this stock engine delivers breathtaking performance. Of course, there's more than just straight-line speed. Thanks to the centre-mounted engine the 4C is extremely agile. Alfa Romeo didn't choose an electronic solution, but instead made the 4C a pure mechanical marvel which leaves it up to the driver to make the most out of this pure-bred racer.